Having to remove tough odours like urine from porous materials such as tile grout is one of the trickiest and most demanding cleaning chores out there. If you are faced with this challenge, but won’t be using the services of professional cleaners, here are some proven strategies to help you get the job done right. When cleaning urine odour (and staining) off grout, you need to apply what’s known as a bio enzyme cleaning solvent.Such cleaning products are specially formulated to react with the enzymes present in urine (which are also partial causes of the distinctive odour). The alternative to using bio enzyme solvents, is live bacteria based cleaning solutions. The first step of the actual cleaning process would be to saturate the affected area. It is really important to actually saturate the surface, not just dampen it. Whether the product(s) you chose require dilution or not, you need to be thorough with the saturation efforts. Once the flooring surface is generously wet, that means grouts are likely saturated too. Next step would be to scrub the solution using a medium hard brush. 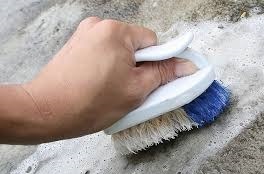 It would be better to use an attachable brush with a hand extension as this will give you more scrubbing power with less effort, and also allow you to cover more surface area with fewer strokes. When using bio enzyme or live bacteria cleaning products, you should see foaming when the product is agitated using a brush or another cleaning tool. Agitate the solution thoroughly and allow it to emulsify properly – check the instructions provided on the label to be sure you are doing things right. In all cases, do not allow for the product to dry out as this puts you back to square one. The final step of the cleaning process would be to wash the floor off the solvent, using a good quality detergent diluted in the necessary amount of (warm) water. Some of the enzyme or bacteria based cleaning systems available on the market, come complete with a wash off detergent that is specially formulated for use with the enzyme or bacteria solvent. If the surface you are cleaning is frequently stained with urine, like for example tiles around toilets or urinals, you should subject tiles and grout work to specialised cleaning using enzyme and bacteria cleaners all the time. 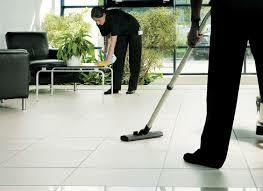 This will also improve overall hygiene throughout the entire premises being cleaned. This entry was posted in Uncategorized on March 12, 2014 by Kurt Grant. The professional cleaning industry has long been applying biobased cleaning products and materials, in an effort to reduce the environmental toll of their work. This is the way of the future, and preserving the environment through sustainable production and use of biobased cleaning systems is great. Before you throw out your cleaning company’s existing product and equipment base in favour of biobased cleaning systems, take the time to understand the pros and cons of using such products. As there are too many upsides and downsides to discuss in detail, here are some of the basic and most important advantages and issues to do with biobased cleaning systems. Cleaning industry specialists and economists Cleaners Bromley have pointed out that production of such materials and products, especially if renewable (for example the cellulose based scrubbing sponges of 3M) is environmentally safer for communities. It also increases productivity and economic performance of rural district. The production process usually increases domestic economy and reduced dependency on foreign goods and materials. Many specialists are in favour of biobased cleaning systems because they use a large portion of plant derived materials and additives as opposed to chemicals and toxins which are energy intensive to product and create pollution in the process. Having said this, biobased cleaning systems are not a panacea solution as they do have certain downsides. Take for example the biofuel debate raging on in the last decade or so. It is evident that bio is not always better as growing crops for chemical feedstock requires fertilisers, pesticides, use of fossil fuelled machinery like tractors, mills etc. Some analysts say that food shortage experienced by many countries in the world can be reduced if efforts were invested into making growing more, healthier edible crops rather than investing all the energy and science into bio fuels and biobased cleaning systems. If you are entertaining the thought of making a switch to biobased cleaning systems for your cleaning company, you need to realise the difference between green products and bio products. ‘Green’ is a rather fuzzy and broad term which may relate to many different characteristics of the given product or material. This however does not make it biobased. On the other hand, not all biobased products are green, although they are derived from plant and animal matter. There is also a third category of cleaning systems based on combination of petroleum derivatives and biobased components. You should consider that too. This entry was posted in Uncategorized on February 12, 2013 by Kurt Grant. If you are in charge of a cleaning company, or work alongside your professional cleaners, day in and day out, then you will definitely appreciate how important it is to keep your staff and yourself safe and healthy during work. Fair enough, professional cleaning may not be as hazardous as mining or the oil industry, but staying safe is always paramount. The level and nature of the safety training which your staff should receive depends on the particular cleaning services you provide. For instance, if your company’s main service is steam cleaning then your staff should undergo training in the safe use and application of pressurised, heated solvents and the respective equipment. Working with heated, pressurised liquids (that includes hot water and steam too) can be dangerous. If your cleaning company deals with professional pressure washing, then you cleaners should be trained to use jet wash equipment in a safe and efficient manner. Pressure washers can cause serious personal injury and property damage if not used properly. Technical understanding of the cleaning equipment being used is also essential – preventing damage or injury sometimes depends on knowing when a machine is faulty, or when signs of fault are visible. Here is another example – if you deal with dry cleaning, or other cleaning services that require use and application of chemicals, solvents etc. your staff must be trained to handle and use these substances carefully. This is even more important when performing such cleaning services in close proximity to customers i.e. when applying cleaning chemicals in occupied residential properties, offices, and to extent commercial establishments. Another good example would be professional window cleaning – sometimes this is done using ladders, extension poles etc. In such cases, it is important to teach staff to stay safe at all times. For instance, reaching out too far when cleaning windows on ladders or when swinging extension poles close to people or breakable property. To show the importance of such safety practices and training – a fall from as little as hundred and fifty centimetres can cause serious personal injury. It is important to stress that your cleaning teams should look out for themselves and each other – common sense is the best ally of good safety training. In certain cases, physical abilities of your cleaners will determine which cleaning services are best suitable for them. Matching available human resources to the right work task is one of the most important aspects of good management. This entry was posted in Uncategorized on March 11, 2012 by Kurt Grant.